THE word “Fire” can mean many things to different people at the different times and places. For example to the typical soldier on war front, “fire” will mean a command to shoot, to the human resources manager and staff, “fire” will mean to sack an employee, to the driver, “fire the engine” will mean to increase the speed of the vehicle while in an establishment “fire” may be an expression of trouble in the place or that all is not well there. To be under “fire” may mean to be sanctioned or criticized severely! However, the most commonly acceptable meaning of fire universally is the burning flame, which we use in cooking or in burning, unwanted materials. Of recent, there has been an upsurge in fire accidents in this country, which have resulted in several loss of lives and properties. Many houses, motor vehicles, machineries and merchandise goods as well as personal effects have been lost to fire incidents especially in the metropolitan cities, particularly in Lagos. It is therefore of great concern to all and sundry to know a little about how to prevent occurrence of fire in our houses as well as other places. It is necessary to first examine the types of fire that are common and their causes. The first type I will like to talk about is domestic fire in our houses. This can be caused by so many factors as such use of candle, kerosene lamp or stove, boiling rings, gas cooker and electrical spark. Sometimes, it is also caused by storing petrol in the house or bringing naked light near a petrol generator. All these can be attributed to ignorance or carelessness. For example, if you lit a candle and put in on a wooden table or stand, when the candle is completely burnt down to the base, fire can result. A friend of mine lost his house to fire because his wife lit a candle and put in the sitting room so that he could find his way when he comes in from his late night outing. Unfortunately, he came very late and the candle burnt to the base and the rug caught fire and burnt the house. If there were no alternative exit, the wife could have been burnt in the house. Cases of fire as a result of petrol storage in the house or bringing naked light to put on a generator are common stories. Similarly, there have been fire caused by somebody boiling water and forget until the water dried up and resulted in fire. Same can happen if a pressing iron is left on and forgotten. Perhaps the most common fire are the ones caused by electrical spark as a result of either overloading the circuit or use of inferior cables or fuse wire of high melting point! It is unfortunate that most electricians do not know the function of a fuse wire in the gear box. Consequently, when the fuse burns, they will replace it with a cable that will not melt when the circuit is overloaded. A fuse wire is a cable of low melting point, which will melt and disconnect light whenever there is overloading. So when you replace it with a cable of high melting point, it will not cut off light when it is overloaded and the result could be fire. Many fires have also been caused by the storage of explosive materials without the correct temperature. The bomb blast that occurred at the Ikeja cantonment that caused a lot of commotion and death of thousands at the Ejigbo canal is a very good example. It was said that the air-conditioners were not working properly due to lack of maintenance, which resulted in overheating and the consequent explosions. Two years ago, fire crackers or banga exploded and caused extensive damage in the central Lagos area. Gas leakage can cause both domestic and industrial fire. Some people will turn on the gas before they start looking for matches and when they eventually strike the match, fire will result because the kitchen was already full of gas. It could also be caused by a leakage in the pipes or connections. Similarly, bringing naked light to a room that has just been flitted by insecticide can cause fire. A car can catch fire through overheating if the water in the radiator dries up. It can also happen if there are electrical cables that melt or are exposed in the wiring system of the car. You can see from the foregoing that most fires are caused by human errors, either through carelessness, forgetfulness or ignorance. Therefore, most fire can be prevented by our being more careful in our day-to-day living habits. 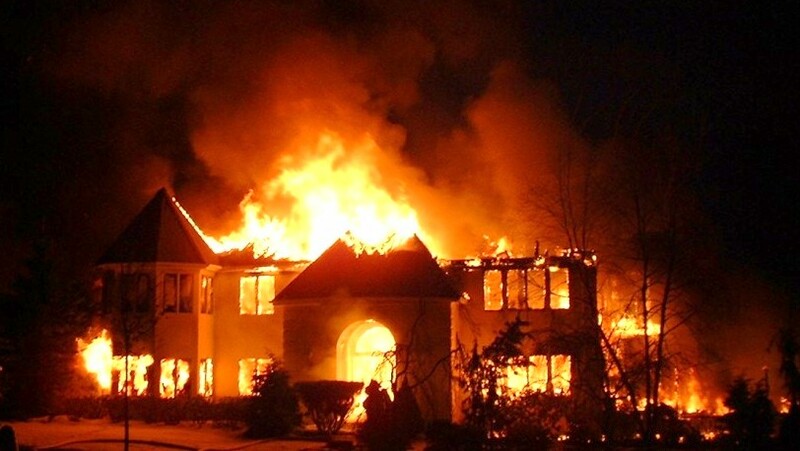 The following specific advice will go along way in helping you to prevent fire in your house. 1. ​To prevent fire from electrical faults, you must never overload electrical ​outlets or sockets. Also do not replace a fuse wire with cable. If the fuse ​got burnt and cut off your light, ask a qualified electrician to find out why it ​cuts off and remedy the cause before putting another fuse. The fuse is ​there to cut off light when there is danger but when you replace it with a ​cable of higher melting point; it will not cut off supply but may result in fire. 2. ​Always turn off all electrical appliances when not in use even for a very short ​moment. These will include air-conditioners, fans, pressing iron, boiling ring ​or kettle, electric cooker, computers, television, and radio. Even when there ​is no light and you are going out, still check that all appliances ​are turned ​off, if possible remove the plugs from the sockets! This is necessary to ​prevent fire that may arise if PHCN should bring power while you are still ​away and there is a surge that is greater than your normal load. 3. ​Check your gas cylinder regular for leakages especially before striking a ​match. It is advisable to let your cylinder be outside the kitchen so that any ​leakage can flow into the air outside the house with less risk of fire. Do not ​turn on the gas before looking for a match to lit it. Keep an eye on ​whatever you are cooking all the time so that you can know when the water ​has dried up. 4. ​Don’t store petrol inside the house! If you must use petrol generator, keep ​the petrol far away from the kitchen and the generator itself. Do not use ​lantern or candle near the generator whenever you want to turn it on. Use ​a flash light! Do not refuel the generator while it is on. If you can avoid ​it, do not use candle or lantern at all in the house. There are so many ​rechargeable lamps these days beside the normal torchlight. These are ​safe to use. 5. ​Do not store any explosives in your house. Gun powder, firecrackers, ​banga, etc, can explode if the temperature becomes very high and result in ​fire. 6. ​Reduce the amount of combustible materials to the barest minimum in the ​house. Do not ​use rug or rubber carpet; they aid fire to spread quickly. ​Leave your floor ​bare with tiles, marble, granite or terrazzo. A concrete ​decked ceiling will prevent fire catching the roof easily. 7. ​If you must smoke, please do not smoke in bed or throw cigarette stubs ​carelessly on combustible materials. Do not smoke near the generator or ​where you store petrol. 8. ​Whenever you use insecticide, do not smoke or bring naked fire into the ​room until the insecticide is no longer potent. It is infact dangerous to your ​health to remain inside a room that has just been flitted with any ​insecticides, talk less of bringing an inflammable object! 9. ​It is important to have fire extinguishers in the house and these should be ​located in conspicuous places where they can be assessed without any ​hindrance in case of fire. Also check them regularly to confirm that they ​have not expired. 10. ​Most of our houses have burglary proof metal bars installed on all doors and ​windows. In the absence of a balcony on the first floor, if fire starts on the ​ground floor while people are upstairs, there is no way to escape! I will ​therefore recommend that one or two burglary proof windows on the first ​floor should be an exit for escape in case of fire. 11. ​Always use qualified electrical engineers when building a new house. You ​will save money by using a half illiterate electrician, but the cost of the risk ​is very high! 12. ​Finally, have an insurance to cover your house. Many people do not see the ​need for this and therefore do not insure their houses. But I tell you, ​insurance is like a seat belt in your car, you may never need it, but it may be ​your saviour one day should there be an accident. Your insurance can cover ​the structure as well as its contents (i.e. furniture and all other items in the ​property). You may even cover loss of income if the property is let out. This ​will ensure that you continue to receive rents even when the house is being ​reconstructed after the fire. ​​ “A stitch in time saves nine” is a common adage. You will do yourself a lot of good if you try to follow the above advice. Fire knows no friend, not even the person who starts. it.